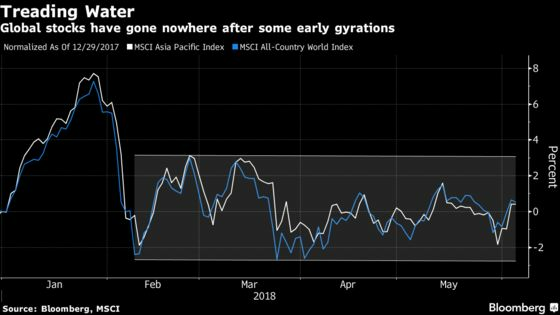 (Bloomberg) -- From an escalating trade spat to increasing geopolitical uncertainty, the list of worries just grows for Asia’s stock investors. Take Hugh Young, head of Asia at $779 billion money manager Aberdeen Standard Investments, who says the markets may be shifting after a period characterized by buoyant returns and low volatility. “When you start to factor in Korea, Iran, Israel, you name it, into the overall equation it does suggest we’re in for a little bit of a bumpy road in the second half of the year,” said Stephen Innes, head of Asia Pacific trading at Oanda Corp.
Geopolitical uncertainty has contributed to a malaise hanging over global markets for much of this year, after a global equity rout killed an early rally. The escalating trade war between China and the U.S. -- part of a wider strategy by U.S. President Donald Trump to enforce new terms with other countries -- looms over all other political issues. A compromise between trade partners is Lam’s base case but that doesn’t mean there can’t be bumps along the road that can derail growth expectations for companies. “I’m not sure whether the whole market is ready for such an earnings dip,” he said. Wendy Liu, the head of China equity research at Nomura Holdings Inc., expects the U.S. to continue to engage China in “reality TV-style” negotiations ahead of the mid-term elections. She predicts a resolution by September that may include increased imports of natural gas and crude oil into China. Don’t forget the central bank stateside. While most expect two or three more rate hikes this year, some think the transition from an easy monetary policy environment to one with stronger growth and higher bond yields will be a difficult one. In contrast to last year, investors have been wrestling with an uncertain outlook for corporate earnings amid higher valuations. Results have been mixed. Tencent Holdings Ltd. has managed to soothe fears with a record profit in May, others like Japan’s Mitsubishi UFJ Financial Group Inc. and Sony Corp. have lowered expectations for the future. 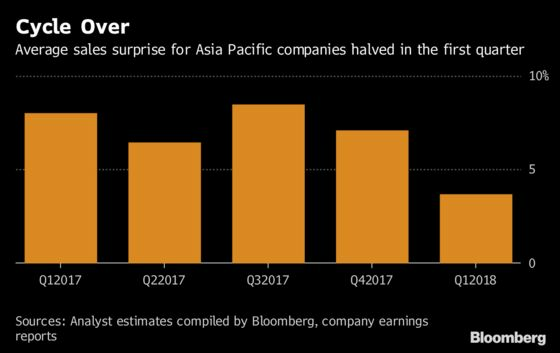 The average sales surprise for companies on the MSCI Asia Pacific Index was 3.7 percent in the first quarter -- the lowest since 2016 -- which is about half of the previous quarter. He still expects more than 10 percent earnings growth in Asia this year. And finally -- as every manager emphasized -- volatility, although worrisome for passive investors, means they’re back in the game. The Cboe Volatility Index, which is the most prominent tracker of volatility, posted a record one-day surge in February as stocks tumbled. It is now back to January levels, below its one-year average. “There are always going to be risks around but it doesn’t mean that we can’t stay invested in good companies that we like,” said Joanna Kwok, whose Asia growth fund at JPMorgan Asset Management has returned over 20 percent in the last 12 months, beating 91 percent of its peers. She has taken some profits off technology holdings after the rally, and has found opportunities within the financial and consumer sectors. The active manager echoed her peers in stressing the importance of choosing “quality companies” and tuning out the noise. “We stay the course,” she said.